Vp Osinbaji in Bayero University, Kano State for the Student Innovation Challenge. A Federal Government initiative in partnership with the private sector, that seeks to fund the best of Nigerian innovation in our universities. Today our students had the opportunity to pitch their innovative ideas, learn the skills required to start and grow a successful business, receive business developmental support and join a network of successful entrepreneurs and innovators. In Bayero University, Kano State for The Student Innovation Challenge. A Federal Government initiative in partnership with the private sector, that seeks to find the best of Nigerian innovation in our universities. Today our students had the opportunity to pitch their innovative ideas, learn the skills required to start and grow a successful business, receive business developmental support and join a network of successful entrepreneurs and innovators. 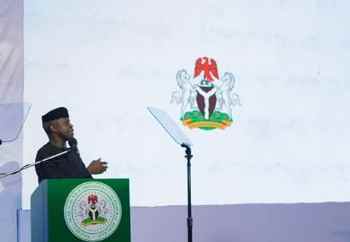 According to VP Osinbajo, the Student Innovation Challenge, an initiative of the Federal Government in collaboration with Private Sector players, offers a platform for us to identify and support innovative, technology driven business ideas and ventures across Nigerian Universities. It is clear to all of us, that the university is one of the most fertile grounds for the development of talent. The Bayero University, Kano (BUK) is already taking a huge step in this direction in collaboration with the Dangote Business School, yet another example of impactful public private collaboration.